In my last post I mentioned how similar I thought Donal Skehan’s Asian Pork Lettuce Cups were to one of our favourite Chinese restaurant starters, Yuk Sung. My husband would happily ‘eat a bucket’ of this stuff (his words!) and I believe him. I once tried a recipe that I found online that required boiling the pork mince first and it was a bit long winded, the results weren’t anything like the Yuk Sung I was used to and my fried rice noodles were too greasy, so when I tried Donal’s Asian Pork Lettuce Cups I decided this would be the ideal starting point to making Yuk Sung and with just a few little tweaks the results tasted exactly like the restaurant version. 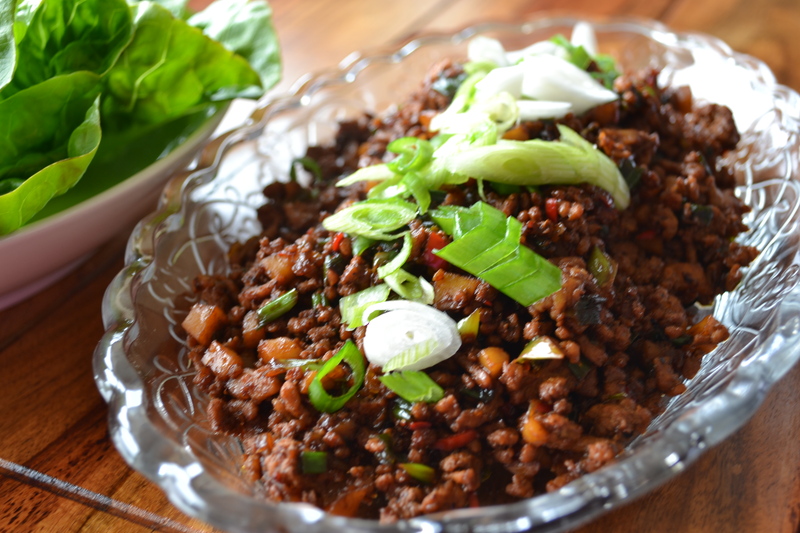 After trying Donal’s Pork Lettuce Cups I prefer this type of dish without the fried rice noodles – it is so much lighter. Heat the sesame oil in a wok on high heat until hot. 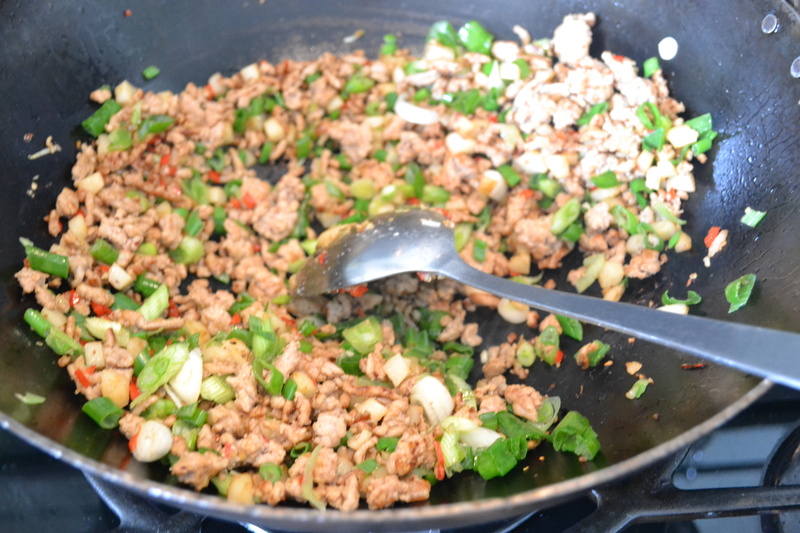 Add in the add the pork mince and fry until all of the meat is cooked through and nicely coloured. 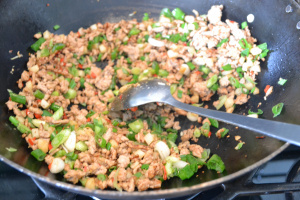 Sprinkle in the sugar and fry for a couple of minutes, stirring well and breaking up any lumps of pork. Next add in the chopped water chestnuts, crushed garlic, chilli and most of the spring onions (retain a couple of tablespoons for garnishing), stir well and continue to fry for a few minutes, stirring constantly to make sure none of the garlic sticks and burns. Turn the heat down to medium and add in the soy sauces, stirring well. Cook for around 5 minutes and then taste to see if it is sweet enough for you or whether you want more soy – some dark soy sauces are stronger than others – I use Pearl River Bridge soy sauce and this is stronger than Amoy Dark Soy so you may want to add more if using another brand depending on your taste. 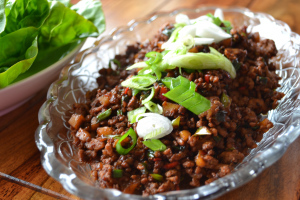 Sprinkle with the remaining spring onions and serve with lettuce. Barbecued Pork Fillet with Vietnamese Caramel SauceIn "Barbecue"
This looks gorgeous,I’m going to try it tonight! Hi Lynn! Oh it is delicious… hope you think so too :) God bless Donal and his Asian Pork Lettuce Cups! Yay!! that’s brilliant. 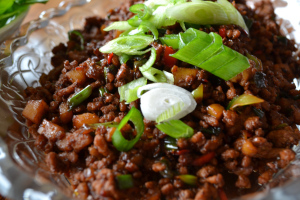 I’m making this again for husband tomorrow night :) I saw Ken Hom recently on telly doing some trick with an iceberg lettuce that make all the leaves separate easily but I can’t for the life of me remember what it was! Must see if I can find it on youtube or something. Oh yes it’s great for heating up later, just leave off the second lot of spring onions until serving.